Sunwing Airlines has taken the keys, so to speak, of its newest acquisition with the delivery of its first Boeing 737 MAX 8 aircraft. The aircraft – which will be flown from Seattle to Toronto later today (Friday) – is the first of four new Boeing 737 MAX 8 aircraft acquired by the company as part of a lease agreement concluded with Air Lease Corporation in late 2014. An official signing over ceremony (pictured) was held last night in Seattle. The $350 million deal also included the acquisition of two further Boeing 737-800 aircraft. The second Boeing 737 MAX 8 aircraft will be delivered next week, with the remaining two 737 MAX planes anticipated to be delivered by April 2019. Press Today’s Greg Coates is on the road with Sunwing and he’ll have a full report in upcoming issues of Canadian Travel Press and Travel Courier, so stay tuned. 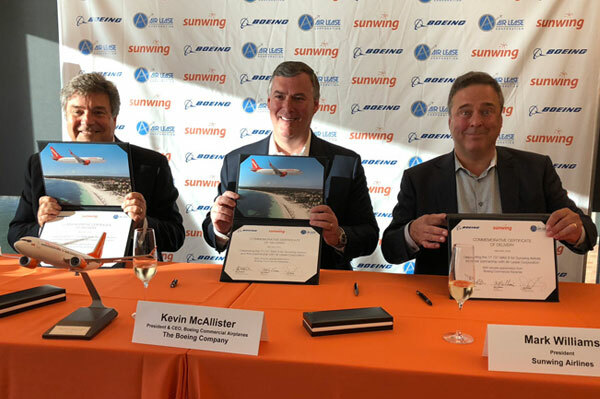 Seen in the photo, from l to r, are John Plueger, CEO & president, Air Lease Corporation; Kevin McAllister, president & CEO, Boeing Commercial Airplanes, The Boeing Company; and Mark Williams, president, Sunwing Airlines.